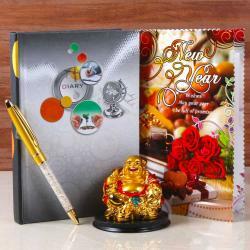 Product Consists : 2018 New Year Diary Book and Finest Pen, Designer Pen and Card Stand with Table Clock along with New Year Card. This New Year gift hamper is definitely a unique and thoughtful gift. This hamper is comprised with 2018 New Year Diary Book and Finest Pen. Imagine when your dear ones will use this, only thing they will remember is your beautiful gift. This hamper comes with the designer stand includes pen and card with Table Clock. 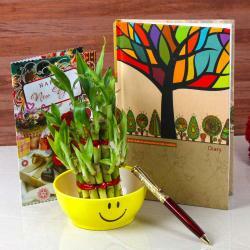 This is not only a decorative gift but also very unique and of a huge utility. 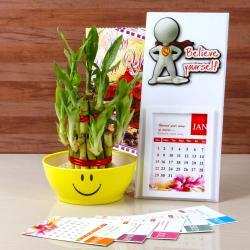 Also, includes New Year greeting card for send the best wishes for prosperous New Year. This is the best way to make your memories last forever. Let them cherish this beautiful gift for a lifetime. 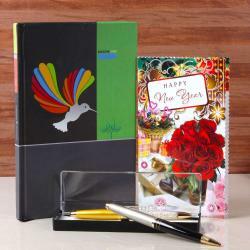 Product Includes: 2018 New Year Diary Book and Finest Pen, Designer Pen and Card Stand with Table Clock along with New Year Card.